The glyphs site at Kariong features almost 300 engravings on two large sandstone walls, which some believe contain examples of an early form of Egyptian writing. Since their discovery in the 1970s, they have long been dismissed as fakes by authorities and most experts but there are still ongoing attempts to prove the theory they were carved by ancient Egyptians several thousand years ago. Over the past three decades, many theories have been put up to explain how the extensive engravings came to be, including that they were the work of a group of Sydney University students. But a group of researchers led by historian Steven Strong has recently discovered a new smaller set of hieroglyphs nearby, and is also investigating a complex, labyrinth of angular tunnels cut deep into the rock beneath the original set of engravings. "It has been carved," he said. "It is straight and nature doesn't do straight lines. "There's a second shaft that runs down and the third one is a gallery that is big enough to park a car in." Mr Strong says new evidence has come to light. "The things that have been found next to it, alongside and around the walls that needs to be factored in," he said. The group is also working with local indigenous elders, who have spoken out about the 'glyphs' for the first time. Steven Strong says the indigenous oral tradition, which is passed down from generation to generation, does accept there was an ancient Egyptian presence on this land. "I listen to the original people for my history," he said. He says with their help, a human bone fragment and jewellery have also been found in the area around the glyphs - adding to the mystery surrounding the site. Mr Strong says preliminary scans recently carried out on the bone conclude it has the same density as a human bone. "Now these are factual things that we're finding and then I've also been given a metal piece of jewellery that doesn't have iron or lead, it's got a figure of someone kneeling on it and there it is right between the two walls," he said. "These are things that don't relate to the walls but it's all around the walls." The discoveries have sparked renewed interest in the mysterious site, and the group plans to carry out a more extensive study of the region next year. New Archaeology proves Egyptians were in Australia over 4,500 years ago. 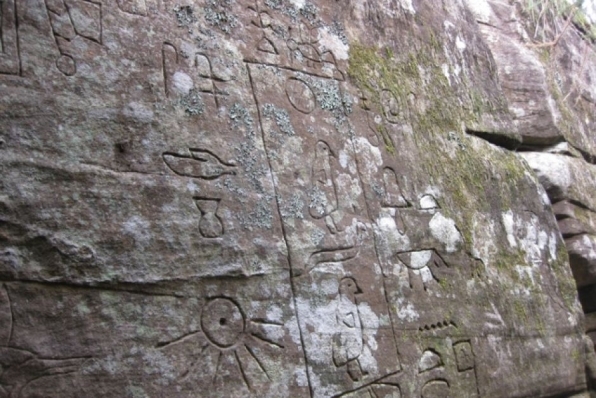 Engraved into two sandstone walls near Kariong (Central Coast NSW) is a set of close to 300 glyphs. Some claim they are authentic Proto-Egyptian hieroglyphs carved by Egyptians over 4,500 years ago, but nearly all academics and relevant authorities dismiss them as merely an elaborate forgery. It Isn’t. Recently discovered artefacts and archaeology, corroborated by testimonials given by Original Elders and Custodians of Lore, stand united in confirming an ancient Egyptian presence and extensive period of contact. In conjunction with the release of our fourth Youtube, Egyptians in Australia-Part 4, an ABC Radio series presented by Mary-Louise Vince (Central Coast Radio), a segment on ABC National News (December 10), and under the guidance of Original Elders and advisors, evidence and sites previously unknown or misunderstood will be shared with the general public. A hidden history is now beginning to be shared, and one chapter, the ancient Egyptian presence in Australia, and in particular the Gosford region, is ready to be told. Over the past year we have discovered or have been shown seven pieces of evidence/archaeology that is strongly suggestive of ancient Egyptian involvement. 1. We have just filmed and investigated a series of tunnels (one over 10 metres in length) and a gallery “big enough to park a car in,” that run beside and under the two walls. 2. A new set of hieroglyphs were found, filmed and interpreted. Situated a considerable distance from the walls, and separated from the claims of what was supposed to be fraudulently concocted solely on those two walls, what was carved here is even more sensational. The message is simple: it confirms not only the death of Nefer-Ti-Ru but the exact place of his internment. 3. When Original Elder Aunty Minnie Mace was standing on-site with Egyptologist Ray Johnson, she found a piece of engraved metal jewellery. It is not magnetic nor made of iron ore or lead, and took Aunty Minnie “half an hour to clean off the dirt,” and may well be an ancient Egyptian relic, perhaps one of Nefer-Ti-Ru’s personal effects. 5. The discovery by Dan Collins of an exotic basalt chisel encrusted with olivite crystals, which was found beneath the newly filmed panel of glyphs, is intriguing. This is sandstone country, and the claim “it most likely originated in Egypt” requires further investigation before acceptance. Nevertheless, it is another anomaly that needs to be acknowledged and considered. 6. Above and all around, and positioned within one kilometre of the walls, are hundreds of Original star markers. The closest to the glyphs, almost directly above, is a cluster of 14 stars which was charted and analysed through astro-cartography software at Sydney University and returned a date of 4,500 years. 7. To begin with we had no interest in the glyphs, we were approached by the group fighting for this land simply because of the archaeology we had seen and reported in a series of articles published in the National Indigenous Times and New Dawn. We have seen engravings amongst Original rock platforms in the immediate area of the Egyptian God Thoth in ibis/human form, in ape/human form, in judgement pose with a moon and sun in each hand, a separate Ankh and ibis footprint, the Egyptian God of Inheritance, an Egyptian boat, etc. The walls ... A much more detailed interpretation will be released on Youtube within the next two weeks (Egyptians in Australia-Part 5), but that is based on opinion and deduction, while all the seven sites/artefacts are written in stone and open to science. The two walls are a focal point, the reason why the other pieces of archaeology came into existence. When evaluating the bona fides of the hieroglyphs on the wall, the other seven pieces of evidence must be factored into that historical big-picture. Separately each of these ‘non-wall’ artefacts deserve serious consideration, united they demand to be acknowledged. We believe what the Elders revealed during our interview (Egyptians in Australia-Part 2) is the final word and must be accepted as such, for they speak on behalf of their ancestors who were there at the time of arrival. The rock ceiling above the walls collapsed in 1960 after a bulldozer drove on top, that recent event, along with the liberal application of “women’s urine” to the hieroglyphs, explains why the markings look so new. The Original reality is that there are two scripts on the walls, the younger is Proto-Egyptian and the more ancient is Original, thus explaining why modern-day experts can not fully interpret what was engraved. These are Original truths. The Original Elders past and present are adamant that ancient Egyptians are responsible for some of what is carved on stone walls: case closed.